Held on July 4th, the parade is a Central Gardens tradition for more than 30 years. This event attracts 300-400 attendees to the 1500 block of Carr Ave. (between Willett and Rozelle). Join us on Independence Day morning for free refreshments, children’s and pets’ patriotic costume competitions, music and more! To be considered for the patriotic costume contest, you must gather at the corner of Rozelle and Carr by 9:00 a.m. Judging will occur at 9:15 and the parade will begin at 10:00 a.m. Contest categories are: Best Patriotic Costume 7 & under and 8 & up, Best Dressed Pet and Best Decorated Vehicle. After the parade, please stay to enjoy hot dogs, popcorn, sno-cones, and drinks...available for everyone! If you have not started to decorate your kids’ bikes and wagons yet, now is the time! 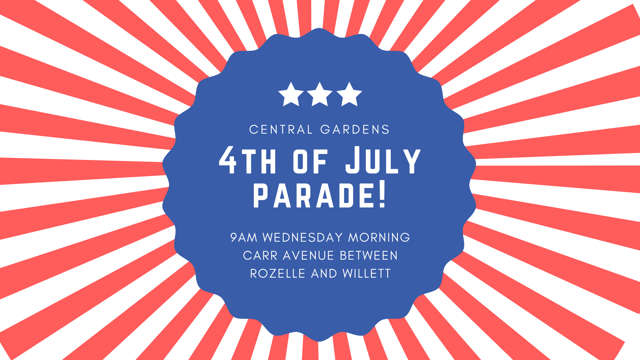 Come join your fellow Central Gardens residents and friends for a day of fun at the annual July 4th parade!